Associate professor Bruno Salena and professor Yingfu Li in the lab. The paper was published online today by the German science journal Angewandte Chemie International Edition. Funding for the study was provided by the Natural Sciences and Engineering Research Council of Canada (NSERC) and the Canadian Institutes of Health Research (CIHR) through the Collaborative Health Research Projects initiative. McMaster researchers have come up a way for inventing molecule probes to quickly identify deadly bacterial strains of infectious disease. The find, published as a “hot paper” by a German scientific journal because of its importance, shows promise for detecting specific strains of bacteria and tracking their specific trail of illness. 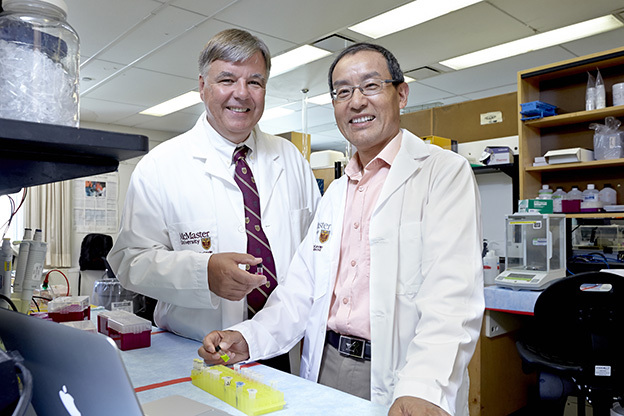 “With this new technology we will be able to develop molecular tools to recognize any superbug down to the specific strain, and there will be many wide-ranging applications,” said Yingfu Li, principal investigator and a professor of biochemistry and biomedical sciences for the Michael G. DeGroote School of Medicine at McMaster. The scientists have found a way to make DNAzymes, or single-stranded catalytic DNA molecules from a simple test tube technique that allows for isolation of rare DNA sequences with special functions. The research team’s first success was the development of a molecular probe that precisely recognizes the strain which caused the 2011 Hamilton, Ont. outbreak of Clostridium difficile infection. This strain was very infectious, resistant to antibiotics and even fatal to some patients. Instead of having to do several different tests to narrow down to a positive identification of the specific strain, the researchers can now quickly pinpoint this superbug using their new molecular probe. “This sets up the stage for numerous other applications where we can exploit synthetic DNAzyme probes for diagnosing infectious disease,” said Li. The test can be done in less than an hour, compared to the current 48 hours, allowing for rapid, more accurate treatment of patients. “This technology can be extended to the further discovery of other superbug strain-specific pathogens. For example, such technology would prove useful in the identification of hypervirulent or resistant strains, implementation of the most appropriate strain-specific treatments and tracking of outbreaks”, said Bruno Salena, a co-author of the study, an associate professor of medicine for the Michael G. DeGroote School of Medicine and a gastroenterologist with Hamilton Health Sciences. “This technology is inexpensive, accessible without a lab, and will ultimately be adaptable to identify not just many other bacteria or viruses, but even other diseases,” he said. The paper was published online today by the German science journal <em>Angewandte Chemie International Edition</em>. Funding for the study was provided by the Natural Sciences and Engineering Research Council of Canada (NSERC) and the Canadian Institutes of Health Research (CIHR) through the Collaborative Health Research Projects initiative.